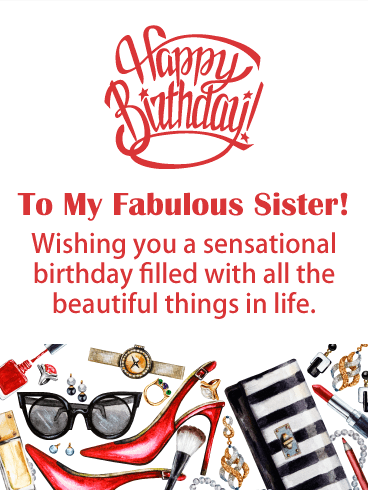 If your sister loves fashionable shoes, jewelry, and cosmetics, then this sensational birthday card would be perfect for her! It showcases everything she would need to look her best for her big celebration day. 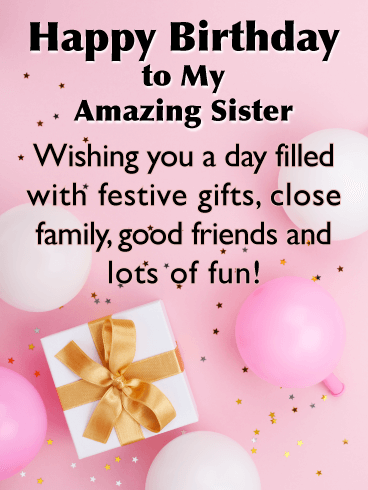 It also wishes your fabulous sister a sensational birthday, and will certainly get her excited about the festivities of the day. So send all these lovely items over to your sister to get her birthday started in a fashionable way! 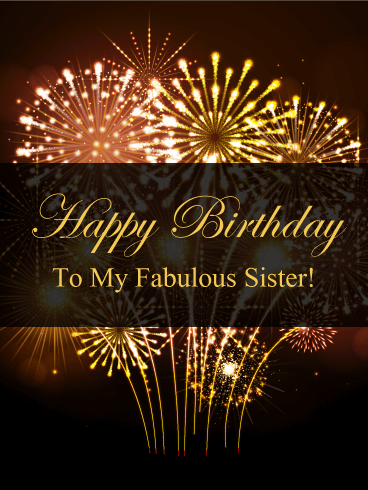 Happy Birthday - To My Fabulous Sister! Wishing you a sensational birthday filled with all the beautiful things in life. 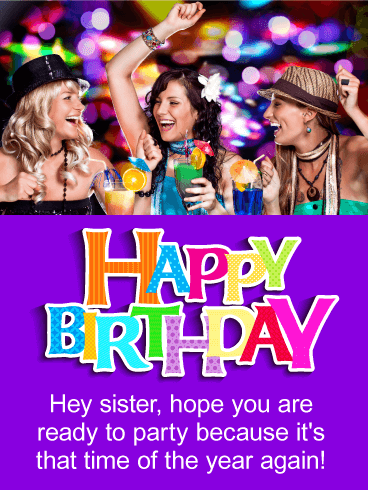 Send your sister a birthday card that will make her special day even more exciting! This wonderful birthday card is bursting with color and displays sparkling balloons, a bright blue background, and fun streamers! It features fun lettering that wishes your sister a happy birthday. 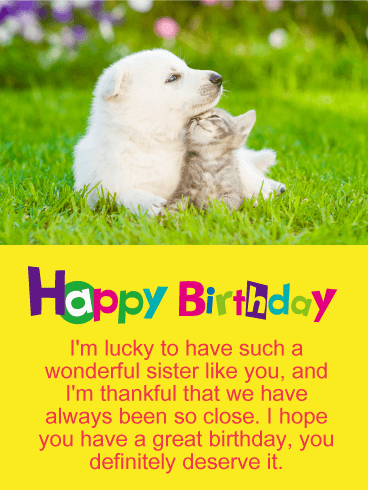 Send this amazing birthday card out to your sister today to get her birthday started, she will be so happy you did! 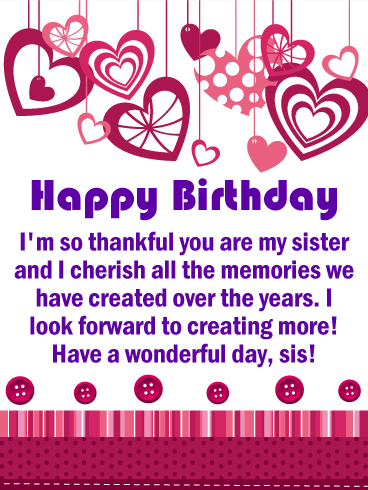 Send your sister this sensational birthday card that features creative hanging hearts, pink buttons, and fun patterns. It will make her day! 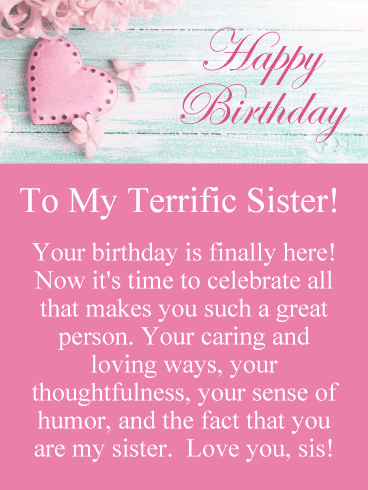 Even better is the special message that expresses how thankful you are to have her as your sister, and that you cherish all the memories you have made together. It will certainly touch her heart! 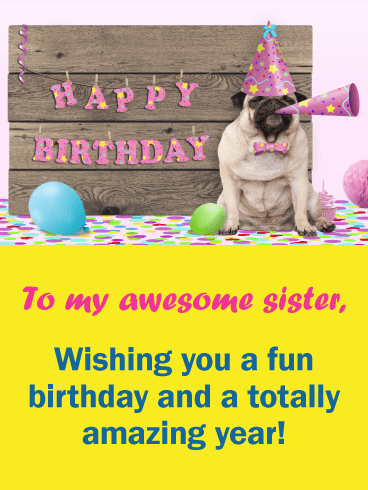 Your sister would love to receive a birthday card like this from her sister, so make sure to send it out soon! 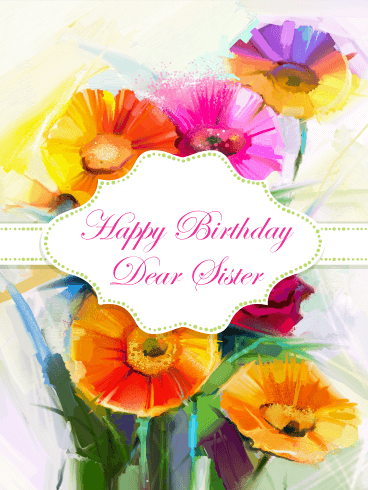 This birthday card was specifically designed for your sister and she is going to love it! It features beautiful colors and fancy happy birthday lettering. The decorative birthday cake has candles that are lit and ready to go! 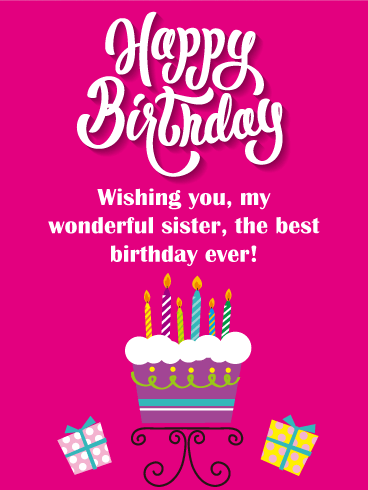 This special birthday card wishes your sister the best birthday ever, and lets her know you think she is wonderful. 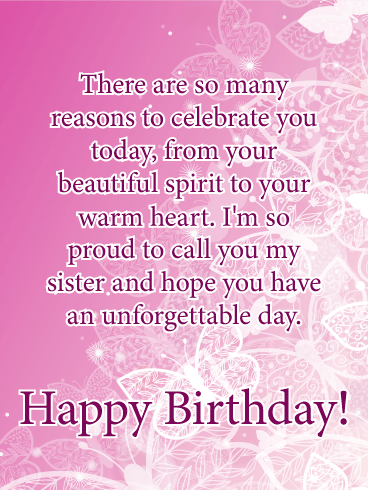 Send this exceptional birthday card out today, it will make your sister very happy on her special day! 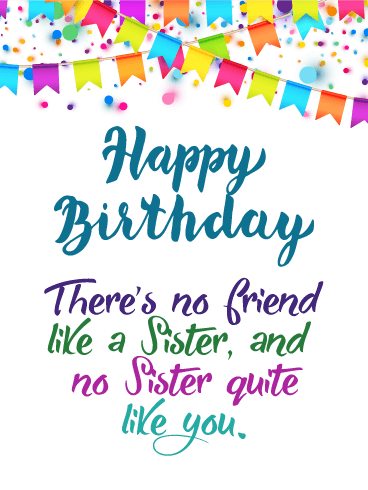 If you and your sister have a close relationship, then this birthday card would be the one to send. It will warm your sister's heart! It features an adorable puppy and kitten who look like they really care about each other. It displays colorful creative happy birthday lettering and a bright yellow background which is very festive. 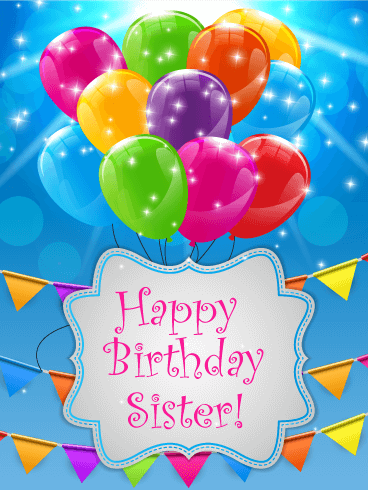 Send this birthday card off to your sister for her special day, she will really appreciate it! Pastel shades of pink and blue make for a lovely birthday card that your sister will really like. The pink heart and flowers are a nice touch, and the message is perfect for the sister you appreciate so much. She will love the fact that you think she is a great person and feel she is caring and loving. Be sure to send this charming greeting card out soon so your sister can receive it in time for her birthday!